Alpha Channel: No; Looped Video: No; Frame Rate: 23.98; Resolution: 1920x1080; Video Encoding: Photo JPEG; File Size: 207MB; Number of Clips: 1; Total Clip(s) Length: 0:21; Individual Clip Lengths: 0:21; Source Audio: No; Color: Full Color; Setting: Outdoors; Pace: Real Time; Composition: Closeup; Movement: Rack Focus. Frozen Trees 4; Frozen Tree; Frozen Trees 1; Winter Is Coming 3; Winter Is Coming 2; Clock Mechanism 4; Clock Mechanism 3. 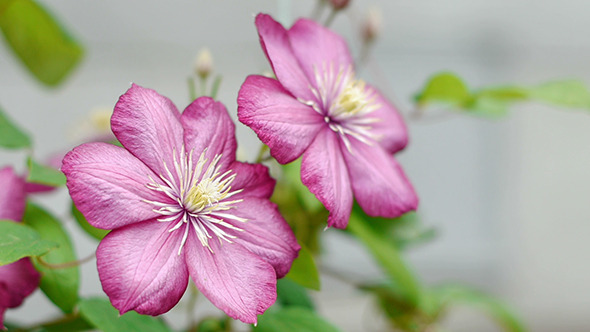 Keywords: autumn, bloom, clematis, floral, flower, garden, nature, pink, red, shake, wind.